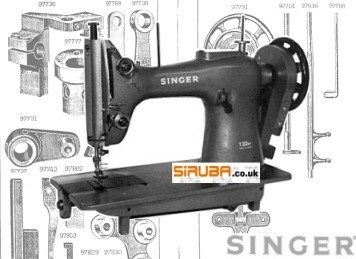 SINGER 132K Heavyweight 'Walking Foot' Lockstitch Machine. Applicable Models = 132K5 132K6 132B5 132B6 etc. Widely used for Heavy Canvas work, Leather and Plastic Sewing and in the manufacture of Tarpaulins. NEED PARTS FOR YOUR SINGER 132K OR 132B Machine? GIVE US A CALL. We can supply you with 'Consumables' & HIGH MORTALITY Parts from Stock. NEEDLES are also available in all sizes. Internal Parts to Special Order.